In the digital age, it seems like there are a thousand ways to stay connected with the people in your life. But there's still something impressive about opening up your mailbox and finding an actual letter or package inside. You still believe in doing some things the old-fashioned way, and that's why we made these eye-catching return address labels. They'll give your outgoing mail an attractive finishing touch, while making the task of filling out envelopes extra easy. You can also use these self-adhesive labels to mark all sorts of personal property with your name and address. 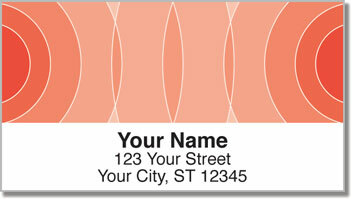 Get Orange Networker Address Labels right now! You'll find a multi-colored option available as well. Plus, don't forget about the matching personal checks.